Minnesota’s first grains of wheat sprouted in the southeastern part of the state, but the epicenter of production soon shifted to the Red River Valley in the northwestern part of the state. Minnesota produced its first wheat in 1820. But because of factors such as sparse farming population in Minnesota, it was not until 1858 that wheat was considered an important crop. As the southeastern farmers began growing wheat, they struggled to adapt the soft winter wheat varieties, planted in the fall and harvested the next year, to the state’s harsh winters. Another variety, hard spring wheat, emerged as a solution: farmers planted it in the spring and harvested in the fall, avoiding the winter months. When a growing number of farmers in the southeastern part of the state began to grow wheat in the 1870s, stem rust and grasshoppers plagued wheat farmers. To prevent stem rust, farmers experimented with chemicals and different wheat varieties. 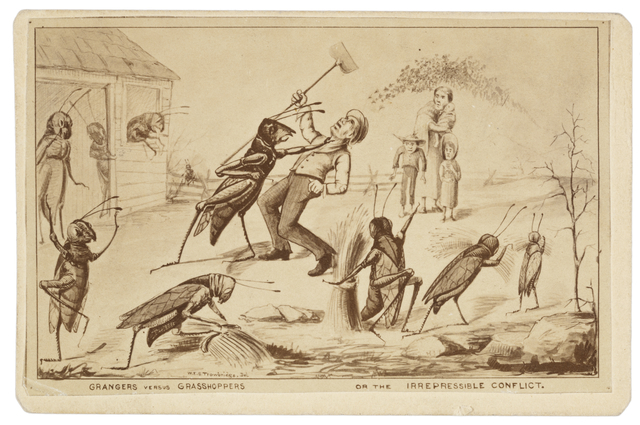 In 1876, grasshoppers damaged half a million acres of crops throughout forty counties in Minnesota. An example of a decline in wheat between 1870 to 1890 is seen in southeastern counties such as Olmsted County, which experienced a decrease in wheat production from 2,117,074 bushels in 1870 to 198,992 bushels in 1890. Farmers in southeastern Minnesota switched away from wheat to other crops, encouraging wheat production to shift towards the fertile lands of the Red River Valley. The Red River Valley case illustrates how the richness of the land allowed farmers to create bonanza farms, farms with an area of more than a thousand acres. Eventually the overproduction of wheat drove down prices for wheat and decreased the fertility of the land. 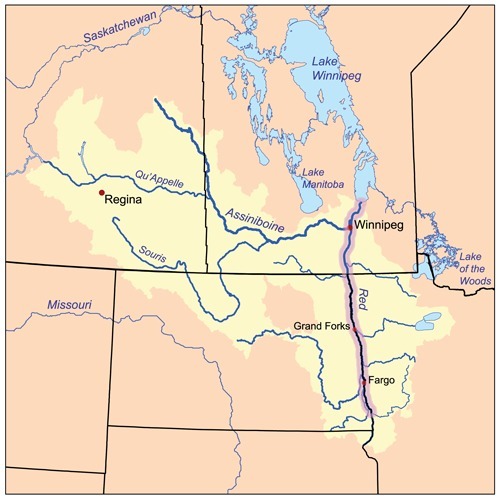 Why did farmers choose the Red River Valley? First, the decline of wheat production in southeastern Minnesota caused farmers to look to the Red River Valley where there was an abundance of fertile lands. Second, the plans to extend the Northern Pacific Railway through the region fell through in 1873. The speculators put its land up for sale at an affordable price for the farmers. Despite the failure of the North Pacific Railway, the state later constructed railways to transport wheat and other crops, connecting the valley to Minneapolis and beyond, which helped the farmers export their wheat. And finally, the strong demand for flour from the nation and Europe encouraged Minnesotan farmers to grow as much wheat as they could. 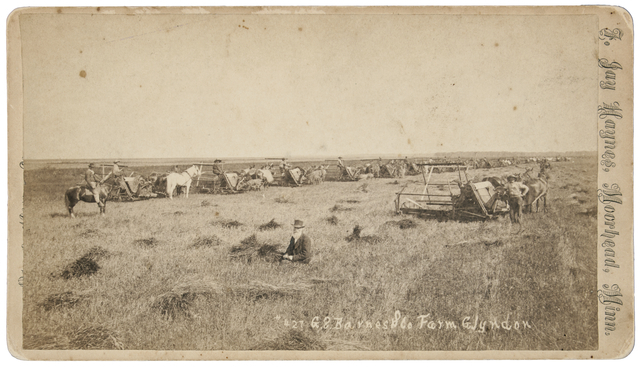 While the bonanza farms in the Red River Valley produced large amounts of wheat during their first few years, they were eventually broken up in smaller farms. One reason for the dissolution of bonanza farms was because the profit that bonanza farmers made was small enough that it was wiped out by tax increases and crop failures. Moreover, a sudden increase in wheat available on the market drove the price of wheat downward. Finally, the overproduction of wheat also depleted soil nutrients, which only exacerbated the problem. Eventually, the bonanza farms were broken up into smaller farms by farmers so that they could adapt to any changes in wheat production or the weather. Takuya Amagai, Sahree Kasper, and the Minnesota Environments Team, “Wheat Farms of Minnesota,” Minnesota Environments, accessed April 26, 2019, http://mnenvironments.carleton.edu/items/show/32. On wheat varieties, see David Danbom, "Flour Power-The Significance of Flour Milling at the Mills." Flour Power-The Significance of Flour Milling at the Mills. January 1, 2003. Accessed November 7, 2014. http://collections.mnhs.org/MNHistoryMagazine/articles/58/v58i05-06p270-285.